Although our diaper stash has an assortment of pocket diapers, prefolds, fitteds, all-in-ones (AI1), and all-in-twos (AI2), we do find ourselves reaching for the pockets more often. Although this will change when my son potty trains, right now I like that the fabric wicks the moisture away from my son’s skin. My husband likes how easy they are to use. I also can’t complain at how quickly they dry. One dryer cycle on low heat, and then I pop them outside in the sun to dry in just a few hours. Made by Kanga Care, the Rumparooz One Size Pocket Diaper is at the pricier end of pocket diapers, retailing at $23.50+ at Diaper Junction. The waterproof outside of this diaper is made with TPU, which I prefer over the more plastic-feeling PUL. This diaper comes with a snap or Aplix closure. 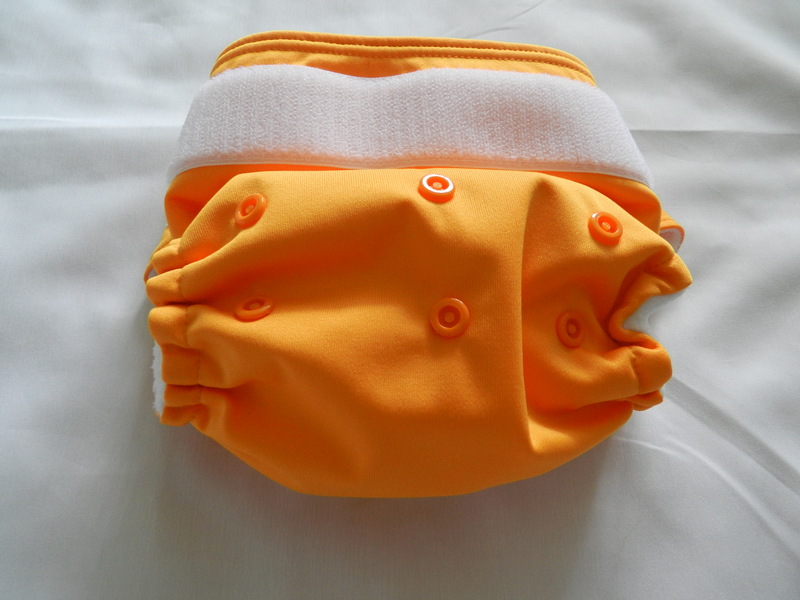 Unlike most one size diapers, Kanga Care states the Rumparooz pocket will fit a child from 6lbs. to 35lbs. and up due to the adjustable rise snaps on the front. This enables the same diaper to be used in four sizes from birth to potty training. The Rumparooz One Size Pocket Diaper comes with two microfiber 6r soakers to be inserted in the pocket. Using the snaps, these two soakers alone and combined comprise 6 different settings: newborn, small/medium, medium/large, medium doubler, girl doubler, and boy doubler. This allows you to customize the absorbency. You can also separately purchase 6r soakers, including those made with hemp or bamboo. The patent-pending double inner gussets are exclusive to Rumparooz. These are designed to hold in messes. 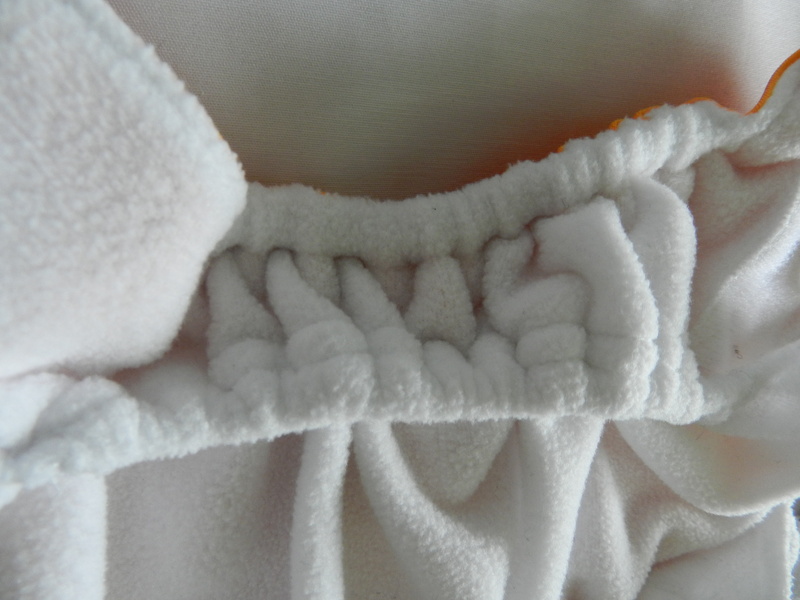 The hypo-allergenic micro-chamois inside of this diaper is super soft against my baby’s skin. It’s a little bulky on my son, but most one-size diapers are, since he’s still pretty young and skinny. He was about 2.5 months in this photo. I ended up using this diaper overnight with him, using the boy doubler setting on the 6r soaker. I was very pleased when there were no leaks the next morning! Pocket diapers usually leak on him if they’re left on longer than a short nap. All in all, it’s a good, solid pocket diaper. It holds a lot; it’s super comfy feeling; it has a lot of adjustability for absorbency and size. I would buy it again. Probably the best thing about this diaper though, is the super cute bum!! Note: These opinions are my own. I was not compensated for this review. This post contains affiliate links.